Humez work-in-progress: a figure from from illustrator George Kocar's Parade of Fools. Pop-surrealist sculptor Leslie Edwards Humez is on a mission to make contemporary art accessible to the blind with her Perceiving Art Through Sculpture (PATS) initiative. For the past six months, Edwards Humez has been creating sculptural replicas of paintings and illustrations—which are then scanned and 3D printed as a means to getting visual ideas into the hands of the blind community (which is estimated to include 3.4 million people in the U.S. alone). Now Edwards Humez is seeking volunteers to bolster the evolving project, which is on its way to becoming a nonprofit and possibly even a permanent museum exhibit. 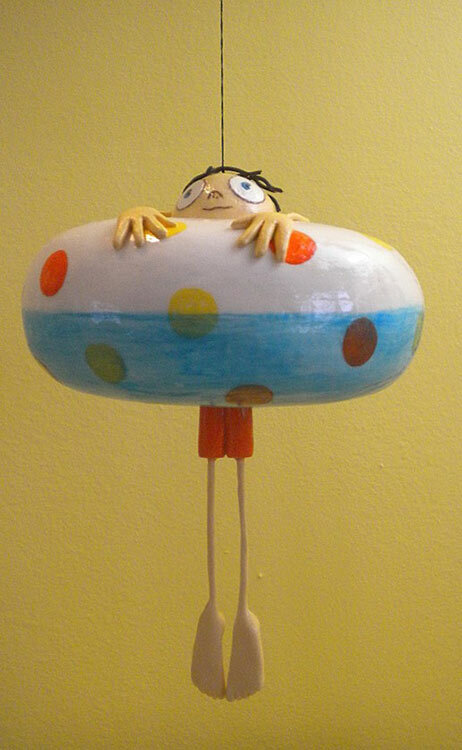 Humez/Angela Oster - Inner Tube Kid"Together, we're creating and do what museums cannot do—taking contemporary paintings and illustrations inspired by current events and making them 'seeable' in a tactile form," says Edwards Humez, who calls the mission "revolutionary." The idea came to Edwards Humez one morning when, after a deep sleep, her eyes wouldn’t open. She panicked, thinking, “Oh, God, what if I couldn’t see? "—her love of art and all the knowledge and experiences she’s gained through her involvement suddenly racing through her mind. Somehow, Edwards Humez knew right away she’d start PATS. Her vision was that she not only wanted to share contemporary art with the visually impaired, but also to empower them to gain an understanding of “two-dimensional messages.” Says Edwards Humez, “A handle on modern artists is a handle on what’s going on in the world." The project has also given Edwards Humez a new path to follow. There’s still an element of surprise, regarding what pieces she chooses to reproduce—work with strong characters and color, strong personality—but the roadmap is somewhat predetermined. 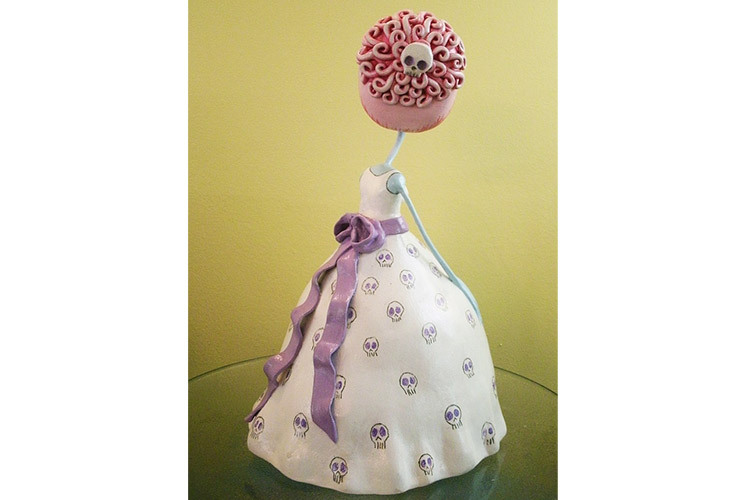 Humez/Angela Oster - Prom MomThe first piece Edwards Humez sculpted was Angela Oster’s “Prom Mom," a monsterified tribute to her late mother, vibrant in her shining prom dress covered in skulls, the back of her head exposing her brain topped off with yet another tiny skull—a detail not visible in the original drawing, lovingly finished with a Day-Glo pink bouffant. This hidden behind-the-scenes look at otherwise flat works is also a draw for all audiences. “There’s something in it for everyone,” said Edwards Humez. With the help of volunteers at Case Western Reserve University’s think[box], Edwards Humez creates her replicas, which can be purchased and added to collectors' homes and lives. A resident sculptor at 78th Street Studios’ Gallery Plus, the Painesville-based sculptor regularly shows off her latest work at the art complex’s monthly Watch it Wednesdays, and she says the ideas have been well-received so far in tests at the gallery. As far as getting involved, Edwards Humez is looking for volunteers from all walks of life to lend a few hours a month to lend their life experiences and expertise to series of advisory meetings designed to ensure PATS is growing its list of collaborators and asking (or answering) the right questions. Edwards Hume is also seeking help with bookkeeping, grant writing, legal needs, transportation, technical assistance, and even an understudy sculptor. For more information, visit clevelandartsculpture.com or the Facebook page.